European settlers also “relied on small game for food,” but instead of the bow and arrow, they used the flintlock rifle. Trapping was also a way they caught their food. You’ll also learn about how and why the small game population increased upon their arrival. Although in this day and age people still hunt small game it is also protected. For example there are hunting seasons and bag limits. When you purchase a hunting license it will “help fish and game agencies keep track of who is hunting what game.” You’ll read about small game habitats, limitations on licenses, conservation efforts, and why we study small game. Before you even can consider hunting, you must learn about “hunting laws and practices that will help you have fun and stay safe.” Most states do require anyone who will be hunting to take hunter safety courses. If you are uncertain, some states do offer mentored hunting programs. State laws and available hunting lands vary from state to state, something the young wannabe hunter will have to look into. You’ll also learn about where you can hunt (or not), key hunting regulations, the code of ethics you should follow “beyond what is in a regulations booklet, the type of guns you might opt to use, firearms safety, other equipment you’ll need, suggestions for hunting an assortment of small game, you’ll be able to take a look at a small game guide, and will learn a bit about field care, and cooking small game. 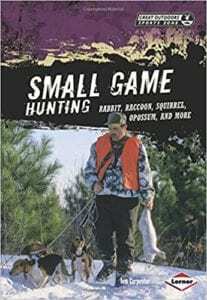 This is an excellent look at hunting small game for the young hunting enthusiast. Although there are many young wannabe hunters, I’ve never seen one book specifically aimed toward the juvenile age group save those aimed toward actual licensing law. The overview is basic, yet the information on small game is a perfect introduction to the sport. The book has numerous photographs (both black and white and full-color), diagrams, and informative sidebars. For example, they cover topics such as blaze orange, firearms safety, and snowshoe hare hunting. This is one in a series of six in the “Great Outdoors Sports Zone.” In the back of the book is an index, a glossary, and additional recommended book and website resources to explore. There are additional free downloadable resources on the publisher’s website. Quill says: If you want to introduce hunting or fishing to the young wannabe sports enthusiast, the "Great Outdoor Sports Zone" series is the perfect place to start!